HERMISTON - The Hermiston Bulldogs hosted the Pasco Bulldogs on Wednesday December 17, 2008 in a game that was delayed one day due to the snow storm that blanked the area. 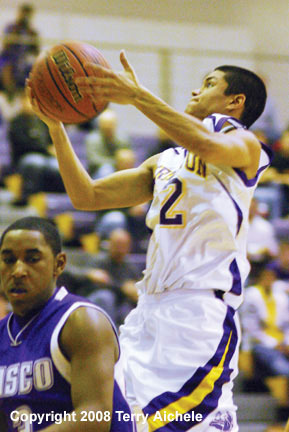 The Hermiston Bulldogs won the game 87-78 which was much closer than that at times. 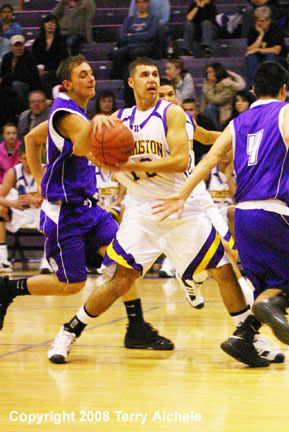 Hermiston controlled the opening minutes of the game. At 5:18 Hermiston lead by six, 9-3 and at one point stretched the lead to ten. Pasco started to find their game became more competitive. Hermiston lead at the end of the first period 22-18. Pasco came out in the second period taking a lot three point attempts. 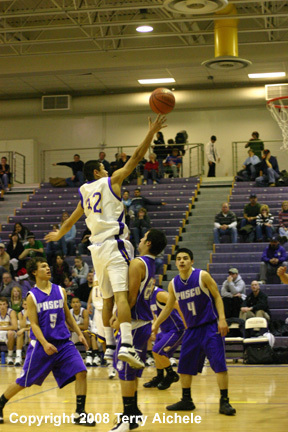 Pasco ended up fouling Hermiston quite a bit sending the Dawgs to the freethrow line seven times. Both teams scored 19 each for the period with Hermiston maintaining its four point lead. Going into halftime Hermiston lead 41-37. The first three minutes of the third period had Pasco outscoring Hermiston 11-6 to take a 48-47 lead. Hermiston came back with scoring by 56-52 lead when the Dawgs big man, Cody Humphrey picked up his fourth personal foul. As the teams went to set up at the freethrow line a technical foul was called on the Hermiston bench. That gave Jeramie Streicher of Pasco four opportunities to score. Streicher hit all four to tie it up at 56-56. 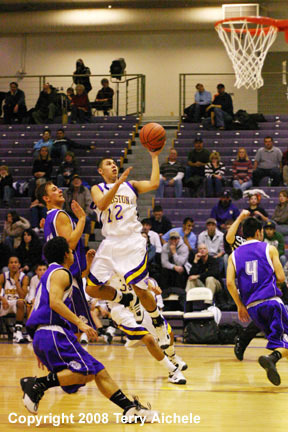 Luis Ortiz of Hermiston made a layup to get the Dawgs back into the lead. The end of the third period had Hermiston leading 59-56. The beginning of the fourth period was tightly played. The teams tied it up 61-61 then Hermiston slowly started to pull away. Hermiston outscored Pasco 28-22 during the fourth. Luis Ortiz had a good period from the floor and the foul line. As the end of game approached Pasco went into foul mode in an attempt to close the gap. 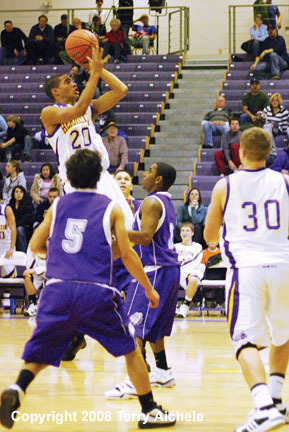 Hermiston was up to the challenge and hit most of their foul shots. Hermiston took the win at the buzzer 87-78. 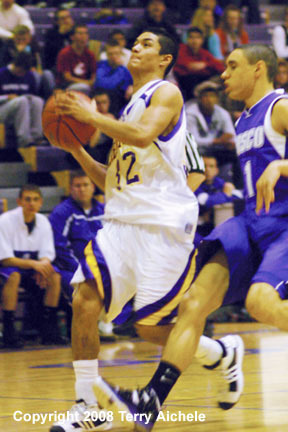 LEFT - Hermiston's Luis Ortiz drives to the basket for a layup. RIGHT - Bradley Irwin of Hermiston controls the ball. LEFT - Hermiston's Bradley Irwin puts up a shot during Wednesday's game. 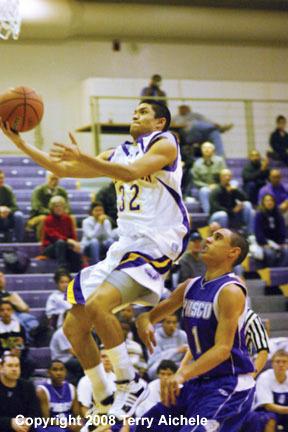 RIGHT - Luis Ortiz of Hermiston takes a shot.